Paper Doll Romance: The Fifth Day of Christmas Winner! On the fifth day of Christmas, PDR gave to Jen (Making it in Madison)... a fun and funky pair of earrings by Heidi Roland. Jen will receive this fantastic pair of 4 inch, dangly and elegant earrings by jewelry and accessory designer, Heidi Roland. 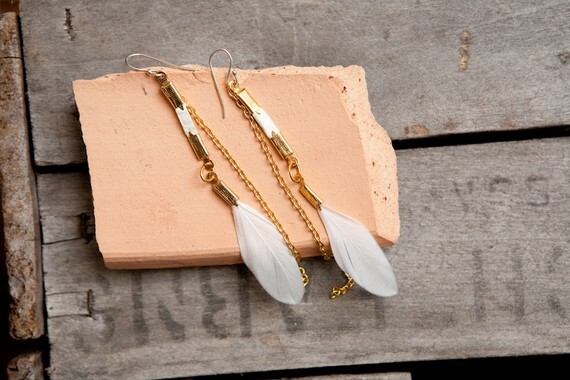 This ultra light pair of earrings features small pieces of white leather, a delicate gold chain, and small, very real, white feathers. Based out of Philadelphia, PA, Heidi Roland creates gorgeous earrings for women who dare to be bold and who aren't afraid to express themselves. Using feathers, leather, gold and other natural materials, Heidi creates a look that is truly one of a kind and certainly one that makes a statement. In addition to these winter white feather earrings, we are loving her simple, yet high impact, leather horseshoe earrings that dangle at a dramatic 5 inches and also her long and lovely feather and leather fringe necklaces. Her expertly crafted earrings are inspired by art, fashion, and free spirited women in a way that is perfectly Pocahontas meets Park Avenue. Thank you, Heidi, for contributing this gorgeous pair of earrings to our 12 Days of Christmas giveaway and congratulations, Jen, on winning these! Never fear, dolls! While this pair of earrings will be on its way to Wisconsin shortly, you can check out Heidi's shop on Etsy for her whole collection and purchase some other great items for yourself, your friends, family, or other bold women in your life. Thanks ladies! Can't wait to wear them! Oooh feather earrings are totally awesome!